The strong smoothie-making, ice-crushing go-anywhere blender that includes 4 "Make-Serve-n-Store" containers and can even grind flax seeds! 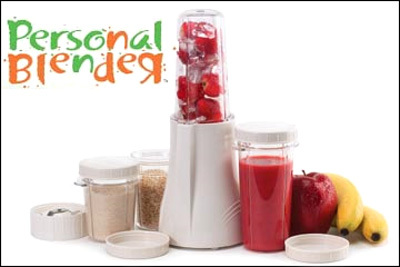 Use the personal blender at home, work or while travelling. It's light, portable and economical. A brochure and a demonstration is available on request. Drink up and Shape up with the First Single-Serving Blender - By Productivity, Inc. Whether you're an athlete, weight lifter, or just trying to stay in control of your diet and health, it's apparent that more people today are opting to replace high calorie and fattening meals with healthy, nutritious blended drinks and smoothies. Although juice and smoothie retail outlets are becoming more prominent, their all-natural offerings are often costly, and there's always some doubt about just how fresh, organic, and low fat their ingredients are. Introducing the Personal Blender, the most versatile, portable and remarkably convenient way to make nutritious liquid blended meals your own way, in your own cup, and in less than a minute....drink up! The Personal Blender from Tribest Corp., a leading designer of high-quality small appliances for healthy lifestyles, is an amazing, all-in-one, durable, and ultra-powerful blender that allows you to make blended smoothies, protein drinks and other scrumptious delights without the hassle of having to stop and clean a bulky blending container every time you switch recipes. Just add your ingredients in one of the Personal Blender's dishwasher-safe, single-serving cups, screw on the stainless steel blade attachment, turn it over, and set it into the base. To blend, gently press down on the top of the cup for a quick blend or press and twist to blend continuously. Simply remove the single-serving cup from the base, turn it over, unscrew the blade attachment, and serve. The whole blending process takes less than a minute. "The best part is that you drink right out of the single-serving cup, so there's no mess to clean up and no cumbersome pitcher to wash," said Tribest Corp. President Jae Choi. "What's more, the Personal Blender comes with two single-serving cups, so you can enjoy a nutritious and delicious smoothie or protein drink just the way you want it, while making a different recipe for a friend or family member in their own cup without the extra cleaning step in between. Once you've finished your blended drink, all you have to clean is the blending cup and the blade attachment." For added convenience, each cup comes with its own lid for easy storage or for on-the-go transporting. The Personal Blender does everything a bigger blender can do, only faster and without the added mess and cleanup. In addition to blending just about any variety of fruit or vegetable, the high-powered, 200-watt motor easily blends ice and frozen fruits. It's also perfect for making sauces, salsa, sorbets, soups, and baby food. And with the stainless steel grinding blade that comes with the PB-200 model, grinding dry ingredients such as coffee beans, nuts, grains, herbs, and even feisty flax seeds is a snap. Designed for maximum convenience, The Personal Blender's less-than-5"-diameter base offers a significant space-saving advantage. And its lightweight, elegant profile lets you move it around the kitchen with ease, or grip and lift it like a martini shaker for extra ingredient agitation. 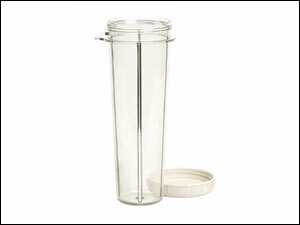 And unlike the big, heavy containers of ordinary blenders, the Personal Blender's single-serving cups fit easily and conveniently in the refrigerator and are made of virtually unbreakable, stain- and odor-resistant polycarbonate, the same material used for making bullet-proof windows and barriers. Tribest's commitment to safety is clearly illustrated by the Personal Blender's serving cup that, unlike traditional blenders, completely encloses the blending and grinding blades. In addition, the blades will not spin unless the cup is locked into its base, providing added protection from injury and other common kitchen accidents. The Personal Blender & Grinder Duo Combination comes with two 16-oz. and two 8-oz. single-serving cups, a blending blade attachment, and an additional 2-pronged grinding blade for grinding coffee beans, nuts, seeds, and more. It comes with with an easy-to-read instruction manual and more than 30 recipe suggestions. For extra on-the-go convenience, it now comes with 3 airtight lids for the containers & 1 commuter sipping lid. 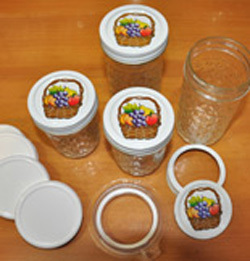 You can easily make the commuter sipping lid airtight by placing apiece of clingwrap or plastic over the top of the container before screwing on the commuter sipping lid. Additional commuter sipping lids and a handsome carrying protective case that can hold the entire Personal Blender Set are also available. The Tribest Personal Blender won the Bronze Award in the Equipment category of the 2004 Alive Awards of Excellence. The Alive Awards of Excellence were held at the 2004 Canadian Health Food Association (CHFA) Trade Show in Toronto. The Alive Awards of Excellence were created eleven years ago to promote and recognize excellence in product innovation, and to add credibility to natural health products. Manufacturers and suppliers were invited to enter products into 18 corresponding categories, accompanied by third-party analysis and organic certification. Retail members of the CHFA cast their votes for the best products in each category based on quality, consumer popularity, and consumer appeal. Big enough for large smoothies! For use with your Personal Blender. Forget about Bisphenol A (BPA) & other plasticisers! Blend up delicious smoothies, baby food, grind coffee beans, herbs and more, then immediately store in these convenient and easy to use glass jars. Perfect to make your dressings in with the glass jar great for storing and serving. This handy lid makes your personal blender even more versatile! 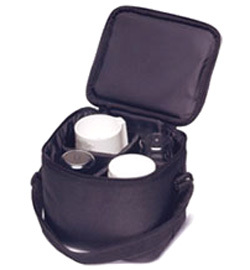 Accessory bag for carrying your Personal Blenders and containers.